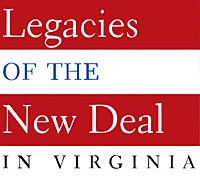 The Library's bibliography The New Deal in Virginia (accessible here as a pdf file) contains many citations to books, articles, oral history interviews, and websites. Below is a short list of published sources and links to selected websites. Clark, Anne Miren. "'The Difficult Adventure of Our History': Murals and Memories in Richmond, 1939-1943." Virginia Cavalcade, 46 (1997): 196-213. Heinemann, Ronald L. "Alphabet Soup: The New Deal Comes to the Relief of Virginia." Virginia Cavalcade, 33 (1983): 4-19. Heineman, Ronald L. Depression and the new Deal in Virginia: The Enduring Dominion. Charlottesville, 1983. Martin-Perdue, Nancy J. and Charles L. Perdue. Talk About Trouble: A New Deal Portrait of Virginians in the Great Depression. Chapel Hill, 1996. Perdue, Charles L., Thomas E. Barden, and Robert K. Phillips. Weevils in the Wheat: Interviews with Virginia Ex-Slaves. Charlottesville, 1976. "Shadows of an Era: The WPA Collection of Virginia Photographs" and "Shadows of an Era: The FSA Collection of Virginia Photographs." Virginia Cavalcade, 36 (1987): 128-143. Virginia Writers' Project. Virginia: A Guide to the Old Dominion. 1941. Reprint. Richmond: Virginia State Library and Archives, 1992. Library of Virginia: Virginia WPA Historical Inventory Project , WPA Life Histories Collection, and a comprehensive list of CCC newspapers (http://www.lva.virginia.gov/public/guides/ccctitle.htm).